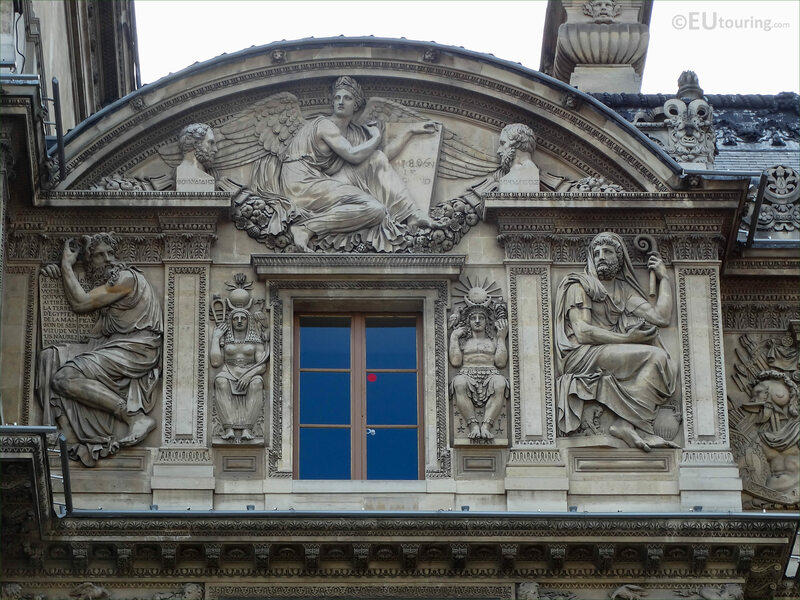 We were at the Musee du Louvre in the 1st Arrondissement of Paris, when we took these high definition photos showing a pediment sculpture called La Loi, Thucydide et d’Herodote, which was sculpted by Jean Guillaume Moitte. La Loi, Thucydide et d’Herodote translates in English to The law, Thucydides and Herodotus and in the this first HD photo you can see the central winged female figure that was designed as an allegory to depict The Law, however, there is a side on bust on either side of this, with these depicting Thucydides and Herodotus. This relief sculpture was produced for the former Palais du Louvre in 1806 by Jean Guillaume Moitte, who was born in 1746 and at the young age of fifteen entered the workshop of Jean Baptiste Pigalle, then studied under Jean Baptiste Lemoyne to become a French sculptor, winning the Prix de Rome in 1768, which led to many commissions, especially for different monuments and funerary statues. 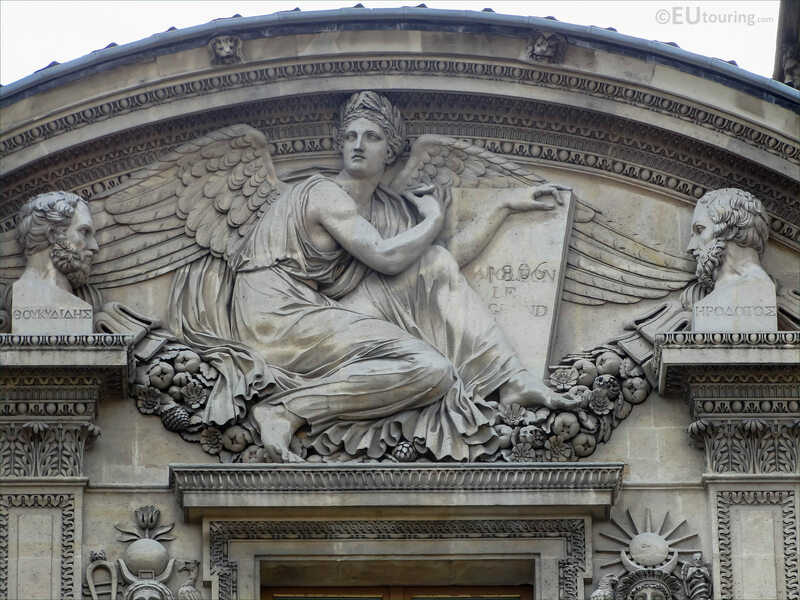 Now this next photograph shows a close up of the three different elements and as you can see, the allegorical figure of La Loi is holding a tablet as though depicting Laws, but with the date 1806. Yet the bust to the left is of Thucydide who was Greek, born in the 400s BC becoming an Athenian historian and general, and incredibly the texts of Thucydides are still studied at universities and advanced military colleges in numerous places throughout the world. However, to the right of the allegory is another bust depicting Herodote, also born in the 400s BC and becoming a Greek historian Heredotus is classed as the Father of History with his account having been studied through antiquity to present day. 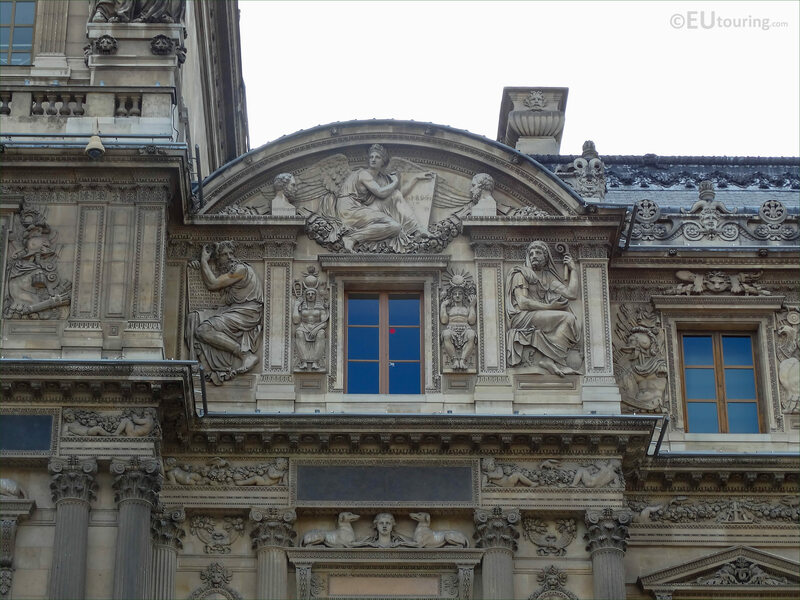 So this particular image shows the pediment and the top part of this section of the Aile Lemercier, and when are you are looking at this eastern facade of the Louvre Museum from the courtyard called the Cour Carree, you will see it is the first pediment on the left hand side of the wing.